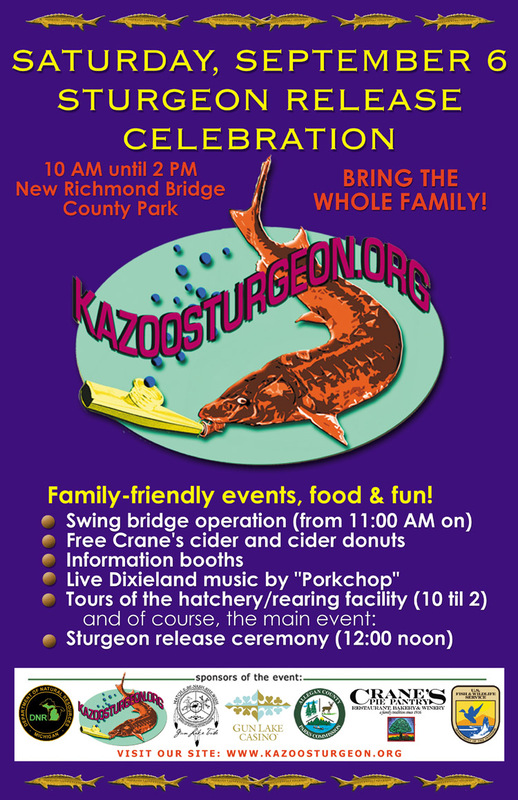 The mission of the Kalamazoo River Sturgeon for Tomorrow, New Richmond Chapter is to support the reestablishment and maintenance of a healthy, self-sustaining Lake Sturgeon population in the Kalamazoo River system by assisting fisheries managers, promoting public education, furthering scientific research and engaging in other activities consistent with Sturgeon habitat rehabilitation. THE LATEST NEWS: NEW (Mar. 24, 2014) - We took pictures of the Kalamazoo River conditions in anticipation of the arrival of the stream-side rearing facility (hatchery) April 2. We will be looking for help once we get some sturgeon eggs/spawn. The Fish and Wildlife Service (FWS) with the Michigan DNR in cooperation and assistance with The Gun Lake Tribe, Allegan County Parks and Recreation. Thank you for your support! We look forward to having an informational meeting soon. Last night, we tried to catch some larval drift in the cone shaped nets up at the dam without success. Earlier in the day, we had caught a 50 year old female who had come to the dam to spawn and a younger male who had come to see what he could get. She was not ready to give up her eggs, so we kept her in a pen overnight to try again today. No luck. We had to let both go. We will try again on Friday to catch her and see if she is ready. We will continue trying to catch larval drift at night for at least the rest of the week. As of now we have only 4 small fish in the hatchery. We are all hoping that the warming weather brings us success in filling the hatchery. These are the two fish we had to release today. 1. "Species Profile - Production of Sturgeon paper"
Just talked to Kregg Smith. There is a female (sturgeon) at the dam, and it appears that she began laying eggs last night. We obtained 8 or 9 eggs in the "mats" that are laid out to catch eggs. Kreggs says he is optomistic that there will be more tomorrow as the eggs reach the mats. They will be out netting and shocking fish at the dam tomorrow. The 8 strugeon that we caught several weeks ago still have not reached the dam. They were implanted with tracking devices that work for about 180 days. Today was a good day. - Supporting research such as the U.S. Fish and Wildlife Service grant to the Gun Lake Tribe. This grant has compiled information on the Kalamazoo River juvenile population. - Applying for grants for river bank restoration and habitat enhancement. - Educating and informing the community about the existence of this threatened species in the Kalamazoo River through event booths and community presentations. Lake Sturgeon (acipenser fulvescens) are amazing creatures dating back to prehistoric times. Sturgeon have a skeleton made partly of bone and partly of cartilage. Their slender bodies are covered with rows of bony plates. Beneath the projecting snout, there is a small, toothless mouth with thick sucking lips. There are four barbels (whiskers) in front of the mouth that are used to direct food. The body is well protected by its plates. A single dorsal fin rises from it's back. In early summer, lake sturgeons migrate toward the shores of freshwater lakes for spawning purposes. They seek out pebbly habitats that have no mud in which to breed and spawn. (Evans 1994). Spawning usually takes place at a depth of 5.4 to 6.0 meters. The females lay a vast number of eggs, anywhere from 2 to 3 million in one season, depending on their size and age. After spawning, the eggs are left to develop on their own.